So, let’s go to that premium human, salmon and wine habitat, Lake Chelan, for a moment, and see how the people are doing. This, after all, is the lake in which hydrofoil boat racing got itself, well, off the water, so to speak. And, you know, that’s the thing. So much power, and where do you go? Why, up into the hills. They’re like waves, right? Right! Beware, though, this is the West, and irony will follow you like soap-on-a-rope. You know, I love it. Sure, that darned motorcycle trail straight up the grassland slope is going to erode the whole mountain into a deep hoodoo of muck and yuck that won’t heal before the United States has gone the way of all other empires, ugh, but the chutzpah, eh! And the sheer joy of it all. That’s a grand thing, worth celebrating. The car wash is just the perfect touch for that. But isn’t that the thing about fun? It’s relative, which means it can change. In this case, it’s about getting physical, about finding a way to match technology with the earth, using bodies to manage the interface rather than minds. That’s, like, so American, you know, but it’s great, too. We can work with that. One of the principle roles of society is to channel young male energy into socially useful purposes. Many thousands of societies over time have figured that out. No doubt, so can we. First, though, a little laughter helps. Oh, and if you’re in Chelan and get a hankering after some Thai food, remember, their ‘medium’ on the spice scale is, like, not on the scale anywhere else. Just a tip, eh. There’s going to come the day when we have to shovel the freeway out of Okanagan Lake, one wheelbarrow load at a time, which a previous generation dumped in there with earth movers and dump trucks and, you know, chutzpah. We might as well bulk up before we start. This is what Gary Snyder called “The Real Work“ (Do click on the link, you get to preview the book) — what we have to do to live on this earth as if we actually lived here. Years back, the East German playwright Stefan Schütz wrote about this in his radio play Peyote, which I translated because in it he pointed out that, to paraphrase, in Pueblo cultures so many people consider that humour is a warm-up act for the spiritual work, which is led by priests, but the humour is actually the real spiritual work, because it cracks the world open to create living space. There’s a short excerpt here. 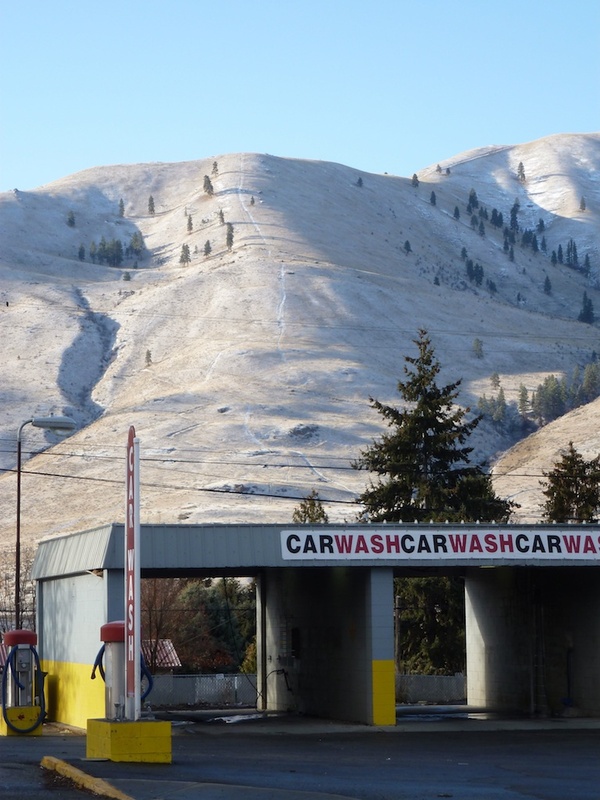 And then off to Chelan with you, where the dialogue between mud and spit-and-polish is alive and well. As Coyote would say (and I’m in a Coyote mood today), Hoooooooooo!